When we hear a song, we usually can’t help but tap our foot to the beat, nod our heads in time or sing along. With its catchy beats and moving rhythms, music also comes with the power to heal. 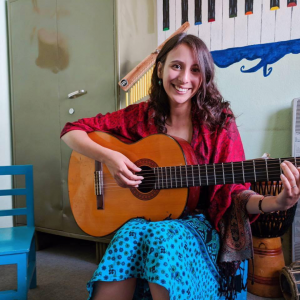 Miya’s passion for the power of music and her entrepreneurial spirit led her to pursue a Master of Arts in Music Therapy and start her own music therapy company, Miya Music Therapy. And the ‘small’ things are by no means insignificant. Imagine a child, who has been working on communication skills, saying a word on his own, prompted by the music, or a senior, who usually looks at the ground, tapping his foot to the beat and smiling. Miya Music Therapy’s slogan is ‘Empowering Individuals, Inspiring Wellness’. This encompasses Miya’s personal and professional mission. “I look to improve the client’s quality of life by empowering them to achieve their therapeutic goals. Music therapy can be so empowering. It can help give a voice to emotions yet to be expressed, it can foster self-confidence, it can create positive social experiences, and it can help individual’s find ways to take charge of their well-being. Miya Adout is a certified music therapist and founder of Miya Music Therapy. Her practice’s therapists work with a range of individuals, including seniors with Alzheimer’s disease, children with autism, teenagers and adults with mental health concerns, and those in end-of-life care. Miya looks forward to her company’s continued growth in order to spread the power of music therapy to more people. Let the power of music lead you. Listen up for Miya’s Music Therapy services on her website, Facebook, Instagram, Twitter.